OP0156. 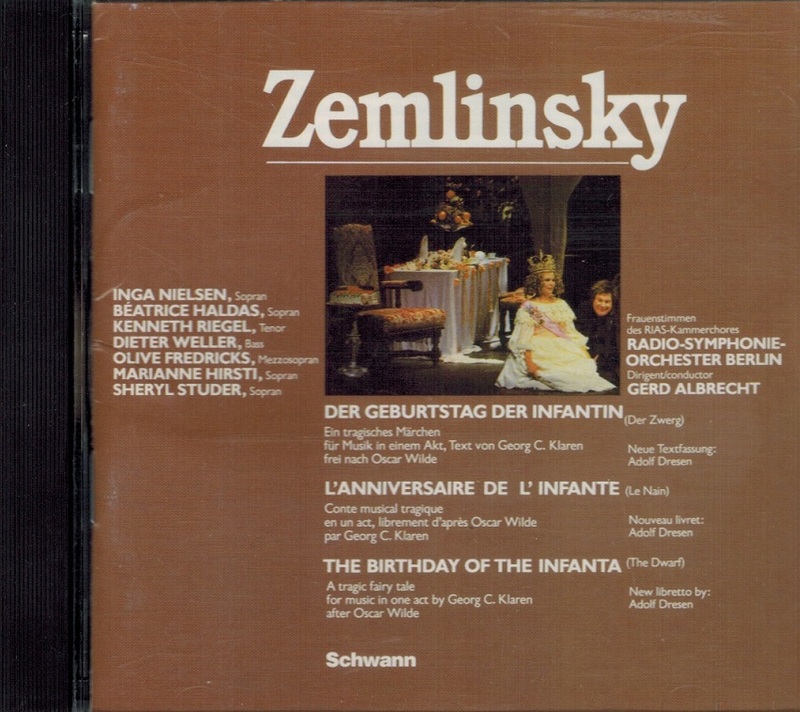 Der Geburtstag der Infantin (The Dwarf) (Zemlinsky), recorded 1983, w.Gerd Albrecht Cond. Berlin Radio S.O. ; Inga Nielsen, Béatrice Haldas, Kennth Riegel, Dieter Weller, Cheryl Studer, etc. (Austria) Schwann Musica Mundi 11626, w.full Libretto. Long out-of-print, final excellent, very sl.used copy! 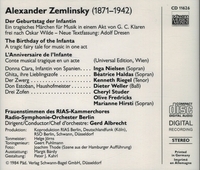 “DER ZWERG (The Dwarf) (or DER GEBURTSTAG DER INFANTIN), Op.17 is an opera in one act by Austrian composer Alexander von Zemlinsky to a libretto by Georg Klaren, freely adapted from the short story THE BIRTHDAY OF THE INFANTA by Oscar Wilde. 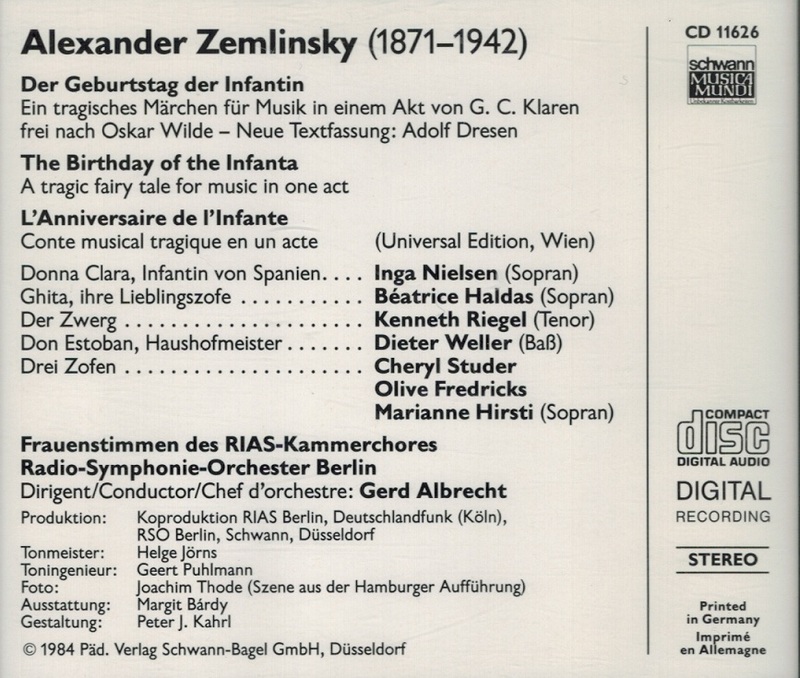 Zemlinsky's choice of this story was a reflection of the end of his relationship with Alma Mahler, and the identification he felt with the drama's main character. He completed the short score in December 1919 and the orchestration in January 1921. The opera's premiere took place on 28 May 1922 at the Stadttheater in Cologne, Germany under the baton of Otto Klemperer. Its last performance in Zemlinsky's lifetime was in 1926 in Berlin-Charlottenburg. The work runs for approximately 90 minutes and is usually paired with another work when performed. In 1981, the Hamburg State Opera presented the first double-bill of Zemlinsky's two one-act operas DER ZWERG and EINE FLORENTINISCHE TRAGÖDIE. DER ZWERG, however, was presented in an abridged version with a substantially altered libretto under the title THE BIRTHDAY OF THE INFANTA. The first modern performances of the opera as Zemlinsky intended it were given in Cologne in February 1996 under the direction of James Conlon.